A large polycotylid from the Pierre Shale (Lower Campanian) of South Dakota, U.S.A.
LEFT: The reconstructed skull of Dolichorhynchops as displayed at the Rocky Mountain Dinosaur Resource Center. The original specimen (KUVP 40001) is in the collection of the University of Kansas Museum of Natural History, Lawrence, Kansas. The skull of this specimen (KUVP 40001) was collected from the Sharon Springs Member of the Pierre Shale of South Dakota in the 1970s. Another specimen, a relatively complete set of post-cranial remains (KUVP 40002) was collected about four miles away in Niobrara County, Wyoming. Together, the two specimens were initially described as a new species, "Trinacromerum bonneri," by Dawn A. Adams in 1997. At about the same time, however, Ken Carpenter (1996) re-described Trinacromerum and Dolichorhynchops, and chronologically limited Trinacromerum to specimens occurring from the Cenomanian through the Turonian (see also Schumacher and Everhart, . 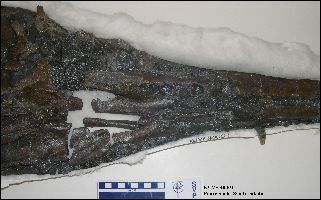 Carpenter (1996) also identified KUVP 40001 as Dolichorhynchops osborni. According to Carpenter, and based on extant specimens at the time, the first occurrence of Dolichorhynchops was in the lower Campanian Smoky Hill Chalk and extended into the lower Pierre Shale. This implies a gap of about 3 million years between the last known occurrence of Trinacromerum bentonianum and the first known occurrence of Dolichorhynchops osborni. More recently, the gap between the two genera has been narrowed somewhat by fragmentary specimens reported by Everhart (2003) in the upper Coniacian Smoky Hill Chalk and the recent discovery of cf. Dolichorhynchops remains in the lower Coniacian Fort Hays Limestone of Jewell County, KS (Everhart, Decker and Decker, 2006). 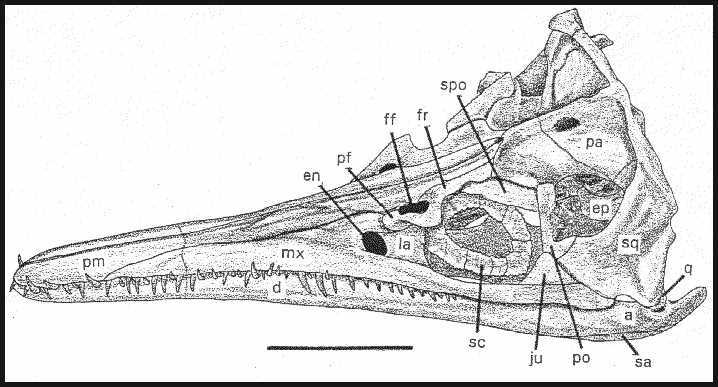 Based on Carpenter's (1996) analysis, it can be assumed that the specimen represents the genus Dolichorhynchops, and not Trinacromerum. However, since the specimen was described and named by Adams (1997) as a new species, there is still some confusion regarding the species name (bonneri). As of December, 2007, the issue had not been formally resolved. In any case, KUVP 40001 and 40002 represent two of the largest polycotylids known from the Western Interior Sea. Besides KUVP 40001 and the three specimens from the Smoky Hill Chalk, there are four skulls of polycotylids identified as Dolichorhynchops from the Pierre Shale (Carpenter, 1996): UCM 35059 (Sharon Springs Member, Pierre Shale, Red Bird, Niobrara County, Wyoming); AMNH 5834 (Sharon Springs Member, Pierre Shale, Red Bird, Niobrara County, Wyoming); UNSM 50133 (Sharon Springs Member, Pierre Shale, Hat Creek drainage, Fall River County, South Dakota); and UNSM 55810 (a small juvenile skull from the Sharon Springs Member, Pierre Shale, Hat Creek drainage, Fall River County, South Dakota). KUVP 40001 was collected from the Wallace Ranch (about 10 feet below the Ardmore Bentonite, Sharon Springs Member, Pierre Shale, Hat Creek drainage, Fall River County, South Dakota) while KUVP 40002 was collected from the Johnson Ranch, northeast of Redbird, Niobrara County, Wyoming about 10 feet above the Ardmore Bentonite, Sharon Springs Formation, Pierre Shale Group. 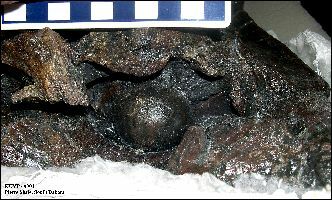 The following pictures of the specimen were taken recently (11/2007) in the collections of the University of Kansas Museum of Natural History. 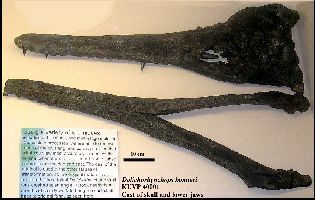 LEFT: The crushed skull of KUVP 40001 in right ventral view. The skull is 98 cm in length. LEFT: The posterior portion of the skull of KUVP 40001 in right ventral view. 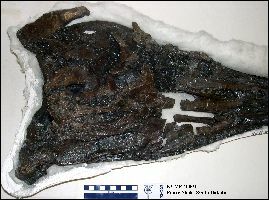 LEFT: The middle portion of the skull of KUVP 40001 in right ventral view. LEFT: The anterior portion of the skull of KUVP 40001 in right ventral view. 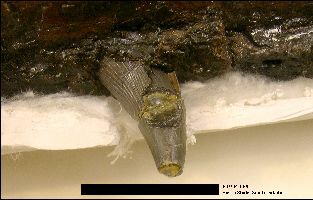 The tooth in the left maxilla indicated by the arrow is shown in close-up view below. LEFT: two complete teeth in the right premaxilla. Scale bar = 5 cm. Although not specifically mentioned in her text, she noted that each premaxilla has 5 teeth (1997, see Fig. 8, Reconstructed skull...). 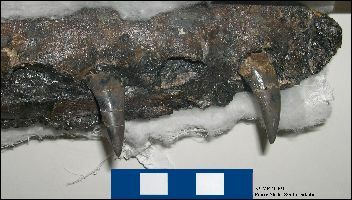 LEFT: The lower jaw of KUVP 40001 in dorsal view. LEFT: Teeth associated with the remains of the skull of KUVP 40001. 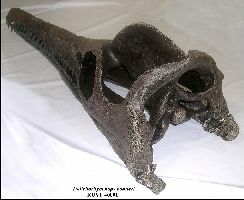 LEFT: A rear (upside-down) view of the skull of KUVP 40001 showing the occipital condyle. The skull of KUVP 40001 was prepared out by Triebold Paleontology (Woodland Park, Colorado) and re-inflated to produce an accurate reconstruction (See my web page about the Rocky Mountain Dinosaur Resource Center for more views of the combined specimens (KUVP 40001 and 40002)). The following pictures, except as noted, of the reconstructed skull were taken in the spring of 2006 at a Gem and Mineral show in Kansas City. LEFT: The reconstructed skull of Dolichorhynchops bonneri (KUVP 40001) in left lateral view. The lower jaw measures about 97 cm. 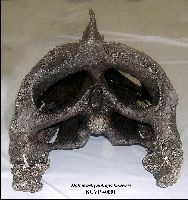 This is the largest known skull of Dolichorhynchops. Another view is here. 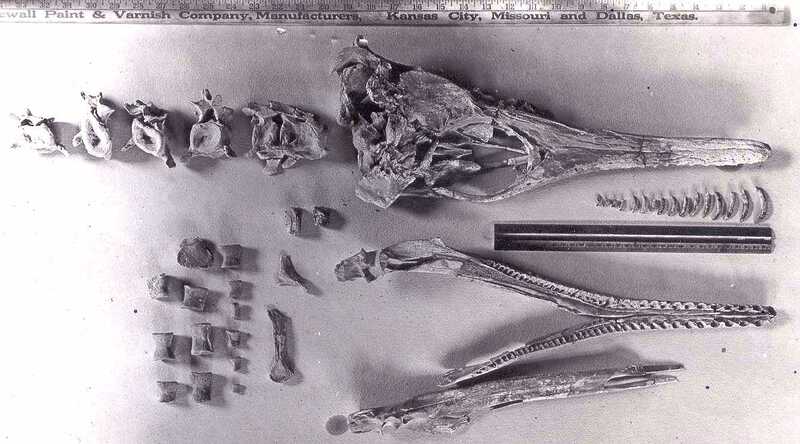 FAR LEFT: A cast of the original skull and lower jaws as collected (Exhibit at the Rocky Mountain Dinosaur Resource Center, Woodland Park, CO). LEFT: The reconstructed skull in posterior left oblique view. RIGHT: The same skull in posterior view. LEFT: Cast of the left rear-paddle of KUVP 40002, a polycotylid from the Pierre Shale of South Dakota. Bonner, O. W. 1964. An osteological study of Nyctosaurus and Trinacromerum with a description of a new species of Nyctosaurus, Unpublished Masters thesis, Fort Hays State University, 63 pages. Brown, D. 1981. The English Upper Jurassic Plesiosauroidea (Reptilia) and a review of the phylogeny and classification of the Plesiosauria. Bulletin of the British Museum (Natural History), Geology 35: 253-347. Carpenter, K. 1996. A review of short-necked plesiosaurs from the Cretaceous of the Western Interior, North America, Neues Jahrbuch für Geologie und Paläeontologie Abhandlungen, (Stuttgart) 201(2): 259-287. Everhart, M.J., Decker, R., and P. Decker, P. 2006. Earliest remains of Dolichorhynchops osborni (Plesiosauria: Polycotylidae) from the basal Fort Hays Limestone, Jewell County, Kansas. Sato, T. 2005. A new polycotylid plesiosaur (Reptilia: Sauropterygia) from the Upper Cretaceous Bearpaw Formation in Saskatchewan, Canada. Journal of Paleontology 79(5): 969-980. Schumacher, B. A. and Everhart, M.J. 2005. A stratigraphic and taxonomic review of plesiosaurs from the old Fort Benton Group of central Kansas: A new assessment of old records. Paludicola 5(2):33-54. Sternberg, G. F. and Walker, M.V. 1957. 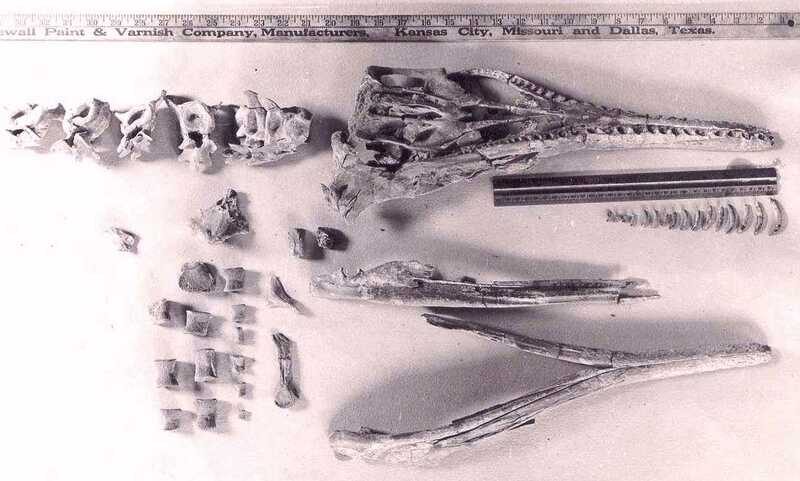 Report on a plesiosaur skeleton from western Kansas. Kansas Academy of Science, Transactions, 60(1):86-87. Williston, S. W. 1903. 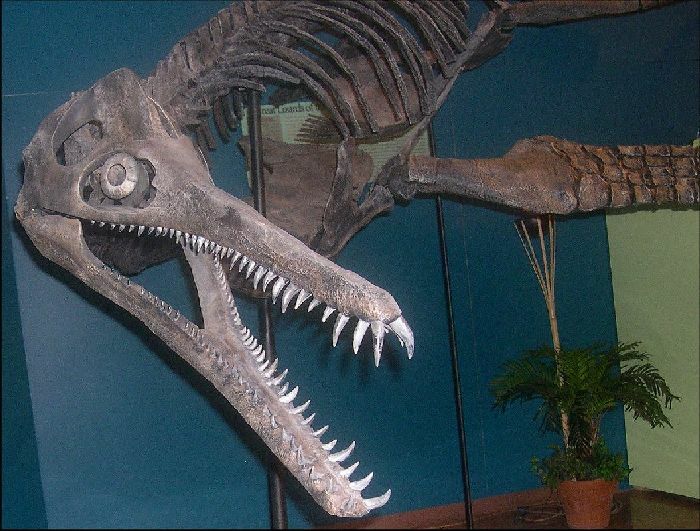 North American Plesiosaurs. Field Columbian Museum, Pub. 73, Geological Series, 2(1):1-79, 29 plates.